You’re super excited to bring your dog with you on vacation. But, pets can be a handful on vacation. Follow these dog travel tips to make sure things go well. Dogs have been humankind’s best friend for tens of thousands of years. Whether you’re like Brazilians who tend to favor small dogs or you can relate more to the Saudi’s who prefer larger breeds, we can all agree dogs are great. But many people seem to think that if they have a dog, they won’t be able to travel. Fortunately, that’s not actually true; dog travel is very possible. You just need to know what you’re doing. After all, if you can travel successfully with small children, it can’t be that difficult to travel with a pooch. To help you out, here are ten tips for traveling with your beloved pup. Before you engage in any type of dog travel, do a test drive first. You may find out that your dog gets carsick. Maybe your dog has a fear of driving or barks incessantly. This is not something you want to find out the hard way. Make sure you are fully aware of how your dog will react in new situations before you travel. If your dog can’t handle surprises, meeting new people or other animals, or is fearful, keep your dog at home. It’s much safer for you and your dog when you crate them. 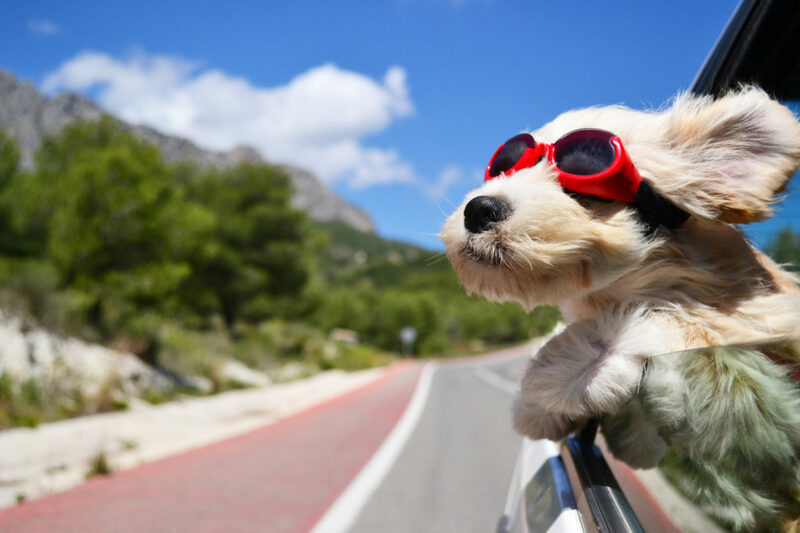 Dog travel is hard enough without worrying if your dog will go flying if you stop your car too fast. Also, you don’t have to worry that the dog will somehow open the car door or get out through the window. And you can rest easy that your dog won’t try to start playing with you as you’re trying to focus on driving. There are several types of dog crates to choose from. Which one is best depends on your needs and the breed of dog you have. Many people keep a travel kit containing toiletries in their suitcase for when they travel. You can do the same for dog travel as well. In the kit, you should keep any travel papers your dog might need. You’ll also need their food, bowl, leash, a waste scoop, plenty of plastic bags, and grooming supplies. Consider having your pet microchipped for identification purposes. Make sure they are always wearing a collar with a tag that has your home address imprinted on it. Go one step further for safety and create a temporary tag that has your cell phone number and any other relevant contact information. Most parents are savvy enough to ask their kids if they’ve gone to the bathroom before embarking upon any traveling. Even if it’s just to the grocery store. Do the same when you embark on any dog travel vacations. Make sure your dog goes for a walk before you travel. Make sure you plan out plenty of time to take them for a walk, not just so that they get exercise right before a long trip, but so that they urinate and poop outside rather than in their crate. During periods of long travel, try to walk your dog as often as possible so they can use the “bathroom” and stretch their legs as often as possible. When you arrive, don’t forget to take your pet on a nice, long walk. Any medications your dog needs should go into their dog travel kit. But make sure you speak with your vet about your dog traveling first. If your dog gets nervous or reacts negatively, you may want to consider giving them a small sedative before they travel. And your vet should be aware that your dog travels. He or she may have a new set of instructions regarding the canine’s healthcare while the dog is traveling. Different businesses have different policies regarding pets. Call ahead to make sure you don’t encounter any unexpected and unpleasant problems. Check to make sure your hotel is pet-friendly. Ask them what their policies are regarding your breed. Call ahead to the airlines to see what their rules are. Often, you need a note from your vet explaining that your dog has already had its shots. Even if you plan on visiting family, call ahead to make sure it’s okay to bring your own pet. Sometimes, family members might have allergies or another pet who won’t take kindly to a stranger in their midst. It’s important to keep your dog calm while traveling. Make sure they get plenty of exercises to help keep them calm. Talk to them in a soothing voice if they start to get nervous. You can also stroke them if they seem too excited. Try rubbing lavender oil on your palms to give them some aromatherapy or giving your dog a massage. One way to make dog travel easier is to let your dog explore their new surroundings. Dogs are naturally curious, and they need to inspect their surroundings. Let them roam around and sniff away. Be vigilant that there’s nothing around your dog can choke or accidentally ingest. Keep an eye on your dog at all times. Dog travel is hard enough without trying to find out if a local store has their favorite food. Plan ahead by bringing their food along. Try looking into freeze-dried food. If you want to know why freeze-dried dog food is better – click here. Don’t forget to bring along their favorite toys and a blanket. Toys are great for two reasons. One, they provide a great deal of comfort for your dog while they are far from home. Two, dog toys are a great way to keep your dog entertained while in a new and strange environment. We love traveling around the world with our family. We also love sharing the tips we’ve learned along the way to our readers. From how to cope with a divorce to learning how to handle being a new mum, we’ve touched on nearly every subject family’s deal with. Keep coming back to read our blog for travel tips and follow us on our adventures.